Provide comfort for the family of Benny Walls with a meaningful gesture of sympathy. Benny Walls, 70, passed away peacefully at St. Francis Hospital in Memphis on Saturday, December 22, 2018. Benny graduated from Vardaman High School in 1966, and attended Northwest Community College. 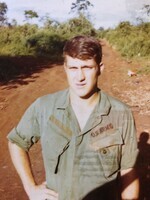 He served in the United States Army in 1969-1970 as Field radio/ Fadac computer technician in Vietnam. After returning from his military service, Benny attended the University of Mississippi where he studied art. He was employed as a surveyor, farmer, and factory worker over the years. He was a member of Vardaman First Baptist Church, and the American Legion. Benny enjoyed art and music, playing bass and singing with local bands and in the church choir. He also enjoyed farming, gardening, his pets, and all of nature. He was a gentle, sensitive, and peaceful man who, like many veterans, struggled at times. Benny had a very strong sense of place and a connection to the land on which he was lovingly raised by his parents and grandparents. A memorial service will be held on Saturday, January 5, 2019 at 2:00pm at Poplar Springs Baptist Church in Vardaman. To send flowers in memory of Benny Walls, please visit our Heartfelt Sympathies Store.